A Thought: Why Celebrate This Day? Palm Sunday to Good Friday (Holy Week) Echoes Life. We have our moments when we are adored, followed by moments we are betrayed and emotionally tortured. Unlike Jesus, most of us will escape intended physical torture. What we must realize is, because Jesus was praised then, crucified, you and I live in a life of Praise to God for our salvation. The Palm Branches of Praise were not the end of the story; the Cross was not the end of the story. The Empty Tomb followed by numerous eyewitness accounts of the resurrected Christ, was not the end of the story! The story is still being written… by you and by me. 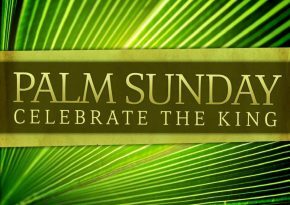 Come Praise Jesus with Palms today! The Breeze of the Spirit will surely be blowing in our church today—-how about yours?